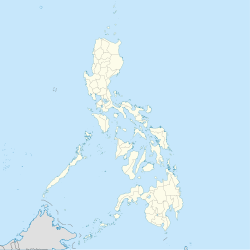 Bagac, officially the Municipality of Bagac, (Tagalog: Bayan ng Bagac; Kapampangan: Balen ning Bagac), is a 3rd class municipality in the province of Bataan, Philippines. According to the 2015 census, it has a population of 26,936 people. With an area of 231.20 square kilometres (89.27 sq mi), Bagac is the largest municipality in Bataan. Bagac is located at 14°36′N 120°24′E﻿ / ﻿14.6°N 120.4°E﻿ / 14.6; 120.4. According to the Philippine Statistics Authority, the municipality has a land area of 231.20 square kilometres (89.27 sq mi)  constituting 16.84% of the 1,372.98-square-kilometre- (530.11 sq mi) total area of Bataan. In the 2015 census, Bagac had a population of 26,936. The population density was 120 inhabitants per square kilometre (310/sq mi). Bagac Friendship Tower. — The monument, symbolizing the renewed friendship between Japan and the Philippines after the events of World War II, was erected by Risshō Kōsei Kai, a Japanese Buddhist organization. The tower was inaugurated on April 8, 1975 and is located about 200 m (660 ft) from where the Bataan Death March started. The 27-metre-high (89 ft) tower is composed of three pillars interconnected by several multi-layer rings. It located at the junction of the Gov. Linao National Road and the road to the Bagac town proper. Las Casas Filipinas de Acuzar. — a heritage park built by José "Gerry" Acuzar, owner of the New San Jose Builders and history art collector. Inside this heritage park is a collection of Spanish Colonial buildings and stone houses (bahay na bato in Tagalog), planned to resemble a settlement reminiscent of the period. These houses were carefully transplanted from different parts of the Philippines and rehabilitated to their former splendor. The Ciudad Real de Acuzar Heritage Park was the location of the TV Show Zorro of GMA Network. ^ a b "Province: Bataan". PSGC Interactive. Quezon City, Philippines: Philippine Statistics Authority. Retrieved 12 November 2016. ^ a b "Municipal: Bagac, Bataan". PSGC Interactive. Quezon City, Philippines: Philippine Statistics Authority. Retrieved 8 January 2016. ^ "Province of Bataan". Municipality Population Data. Local Water Utilities Administration Research Division. Retrieved 17 December 2016. ^ "Friendship Tower in the Philippines". Rissho Kosei-kai. Archived from the original on July 30, 2007. Retrieved September 9, 2007. Wikimedia Commons has media related to Bagac, Bataan. This page was last edited on 16 March 2019, at 07:36 (UTC).